Alright, last week we gave you an idea for how to do the Nautical Look. Now for another fun trend in 2011…the 70’s inspired trend! As we were noticing the celebs wearing the look and were seeing it on the runway, we knew RIGHT AWAY that people were going to need our Mod Bod Basic Line for all the beautiful sheer tops. You really can’t get away with just wearing a bra underneath. You need more coverage to make it work for the work place or family events. And a Mod Bod top won’t take away from the femininity and flowiness of those great 70’s sheer tops. I mean, look how stunning and classic this outfit looks with some 70’s flair! We love it, but it is great to use our basic line to stay modest with these sheer, flowy 70’s blouses…white or not! We will have a video soon on the new spring line! We have touched a bit on the 2011 spring trends. We have mentioned more of the Military Inspired look and 70’s Inspired look Another one that will be in is the Nautical look. Today we wanted to start off a series of posts to show you how mod bod can help tie each look together in a really great way. Today we are doing Nautical! This trend comes and goes throughout the years…it is always a safe look to have in your closet and wear anytime but there are certain years and seasons when it is a bigger trend. Here are some key items to have in your wardrobe that can be used for this look or something completely different on another day. #1 Striped Shirts that FIT right. You have to be careful with stripes by having the shirt fit the right way or pairing it with the right kind of jacket or cardigan. #2 White Pants or Denim: Last year we had some killer white denim that got picked up so fast and was perfect for this Nautical look. We can’t wait to show you what we have for THIS year! Some people don’t look so great in the striped shirts, so BREAKING up the stripes can help solve this problem like Christina did in the above picture. Christina looks fabulous in her nautical look because it’s not so “by the book.” She put the stripes in her light weight cardigan and layered a tank under it.Our Perfect Tank would be the ideal choice to pull that look together. And it comes in white, which is one of the essential colors for the Nautical theme! These are just really quick snapshots of our Tulip Skirt, but we wanted to give you more of an idea of the different colors available in our Tulip Skirt. The mid-calf length classic design of our jersey knit Tulip Skirt will never leave you lacking in style or comfort. Dressed up or dressed down, your relaxed yet classy sense of style will shine through in the Tulip Skirt. Bridal parties: the wide range of sizes and the flattering fit are perfect for bridal parties. (The wide waist band is perfect to hide tummies, the flared A line cut hides bigger hips.) The women in your wedding party will love that they can wear the skirt after the wedding. They will remember your perfect day every time they wear it, which will be a lot! If you add your wedding colors in the tops, it will make for the perfect economical wedding party outfit. Get one for yourself too! The perfect casual, yet chic summer outfit. Pair it with a fun summer Cami or Racerbank Tank, a Mod Bod Tank, Cami or Cap Tease to go underneath. A beautiful spring outfit. Add a flowy cardigan with a Perfect Tee underneath and throw on a great necklace. A perfect sharp-looking, yet comfortable outfit during the cold winter months. Pair it with a form-fitting turtleneck. Dressing up or staying casual. 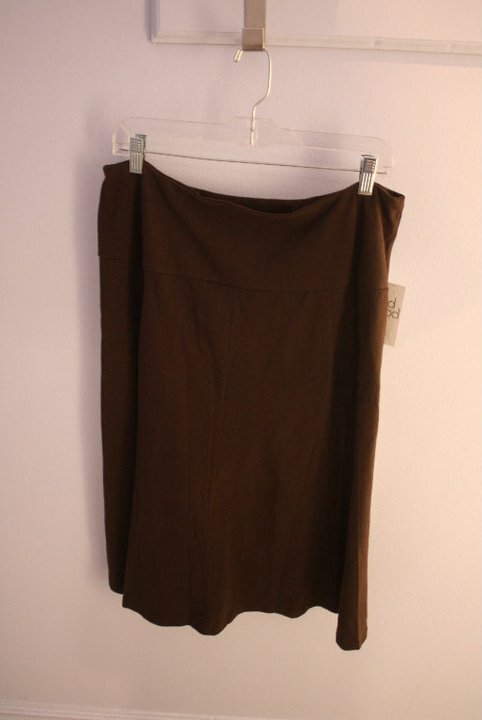 This is a great skirt to dress up a bit to use for work, church, meetings, etc. But you can also make it casual to wear on a date, lunch with friends or running around with the kids. Did you see the three outfits that we featured on Monday? If not, scroll down a bit and catch up on those! Today we have three more fun outfits put together with our Mod Bod pieces. Outfit #1: A pair of black pants that fit you just perfect and a vest that is the right length and gives you a waist are two much haves in your wardrobe. It can be one of your go-to outfits! Just pick up some of our Perfect V Necks (that have the lower neckline and 3/4 length sleeves) in some great colors and you are set! Outfit #2: Layering at its best! We have the Lacey Front Cami in a POP of color, Belle Skirt in black, Perfect Long Sleeve in White and then a black blazer. All essentials that you can mix and match to make completely different outfits. And there are quite a few of them! Outfit #3: Another example of layering at its best and put together to keep you warm. Sure, this looks like a winter outfit but re-arrange the pieces, take some out and you have another perfect ensemble for spring. In this picture we have the Jace Turtleneck, Perfect Cami with Lace and the Draped Cardigan tied closer to the body with a belt or fabric. This week we have SIX new outfit ideas for you that use Mod Bod pieces, so let us jump right in and show them off to you! Outfit #1: We have a great black knit cardigan from another vendor (but you can buy it in our Mod Bod store at University Mall). This is a cardigan that you know will last you for years and be in style for a long time. We paired it with two of our shirts. If you look closely, you can see that is our LACEY Front Cami (we love adding in a bit of femininity to dark colors and the lace does that) and our Perfect V Neck which has that low-scooped neckline. With our Belle Skirt in Royal Blue, doesn’t it POP? And of course you have to wear a pair of perfect boots along with it. Outfit #2: These see through lace tops are becoming such a big trend. They are fun to layer. You can pick up one made by another vendor in our Mod Bod store at University Mall. But don’t you dare wear this without the right coverage underneath!! In this outfit we have just put a Perfect Cami underneath. That way it will still be cool enough for spring and you can have some skin showing underneath the lace. Pairing it with the Marie Skirt in black makes it look appropriate enough for work, church, meetings, etc. Outfit #3: We used that knit cardigan in this outfit again as well! 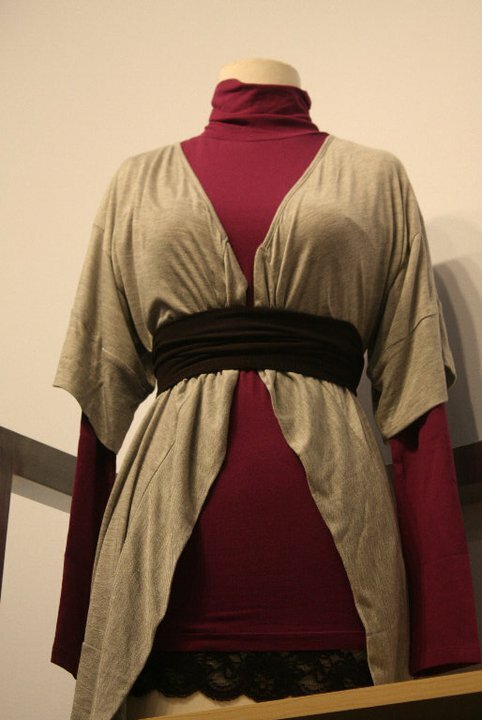 We just love the Jace Turtleneck in this beautiful color. We think it really just makes the whole outfit. 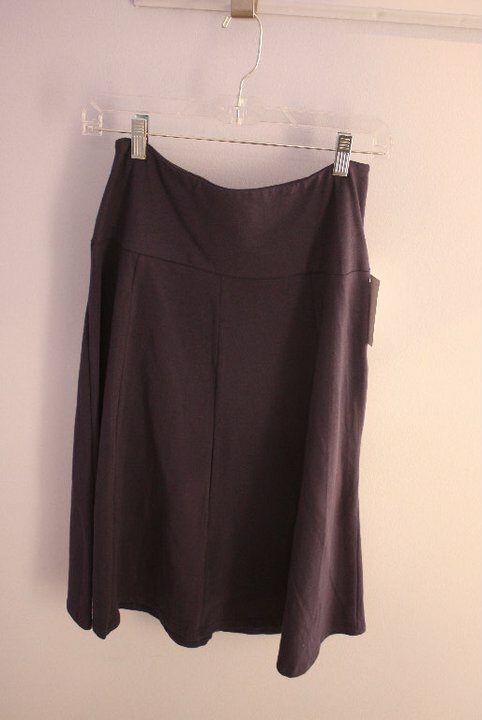 We have it with the Victoria Skirt with Pleats. We are pretty sure every woman out there should have this in her wardrobe. Did you catch the video on Monday talking about the Demi Caps and Demi Camis? If not, scroll down and watch it! We (once again) wanted to start off with the disclaimer that the Demi Caps and Demi Camis are NOT available online yet but we are going to let you know as soon as they are. 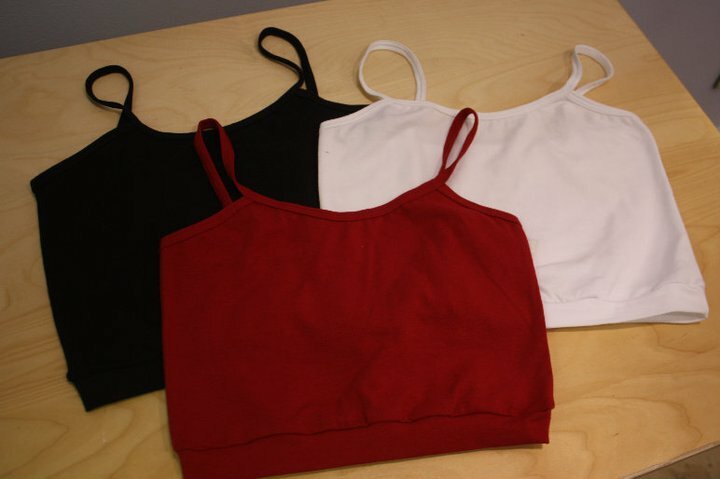 But if you live in Utah you can get the Demi Caps and Demi Camis in red, white and black at our store in the University Mall. Now on to these great new shirts and all the ways you can use them! #1 Petit or Shorter Torsoed Women: Regular layering shirts might be way too long for you but you still want to have more coverage up on top or put together a fun layered look. These will be PERFECT for you. #2 Pregnancy or Nursing: One of the cute employees in our store is pregnant, and when we first made these she was hooked after day one with them. She tells every single other pregnant customer who walks through the door. She loves them because they don’t give her weird layering lines, are so much more comfortable and keep her cooler while getting through those last overheated months of pregnancy. She also can layer them under the very popular maxi dress for maternity wear or just to complete a layered look. These also work great for nursing. #3 Exercise: The dancers that have come into the store looking for new workout gear were so excited to see these Demi Caps and Demi Camis. They give them a bit more movement. People just looking for yoga gear or gym gear have been picking them up as well. #4 Summer Months: There might be tops or dresses that you want to wear during the summer months that aren’t modest enough on top but you don’t want to deal with having a WHOLE shirt underneath during the summer months. Now we have created a product that completely solves this problem. First off, we wanted to start out with the disclaimer that…the new Demi Caps and Camis are NOT available online yet. But of course we will let you know as soon as they are! For now, if you live in Utah you can pick them up in red, white and black at the University Mall. 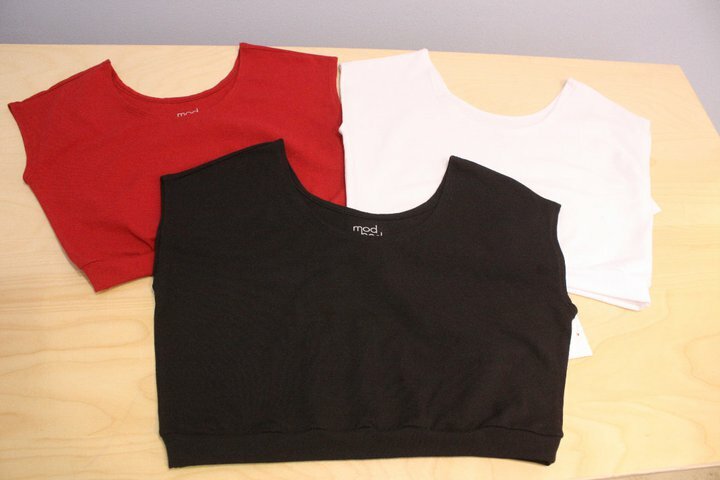 Stay tuned because on Wednesday we will show off some styling tips for these new Demi Caps and Demi Camis!